Comprised of approximately 200 students, Mountain View High School orchestras perform quarterly in the school’s 1200-seat auditorium. Each school year culminates with the legendary Surround Sound concert. Our orchestra program includes five orchestras. With the exception of our Concert orchestra, students audition for placement based on their skill level and performance ability. Concert Orchestra students develop intermediate to advanced string techniques. This program does not require students to audition. Intermediate to advanced level students perform popular and light classical musical selections selected to advance their performance skills. At the director’s discretion, Philharmonia may attend fall or area concert festivals. A full-string music ensemble, students selected for Sinfonia perform classical arrangements and compositions requiring advanced skills. Sinfonia performs at multiple concert festivals each year, where they regularly receive superior ratings for their performances. Students earning a place in Symphony have demonstrated excellent musicianship performance skills. Beginning each November and continuing through the spring semester, Symphony combines with wind players from the MVHS Wind Ensemble to perform full orchestral works by some of music’s best known composers. Symphony performs at multiple concert festivals each year, where they regularly receive top honors for their performances. Musicians selected to perform with this elite, small group include only the most skilled, motivated, and disciplined orchestra students. 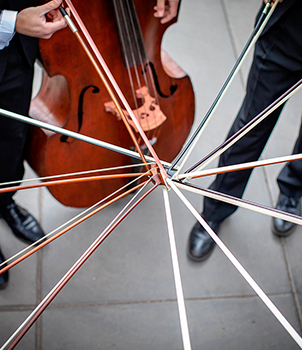 Under the direction of Dr. Temme, Chamber students practice classical string repertoire requiring technical and musical expertise, which they later perform without a conductor. Chamber performs at multiple concert festivals each year, where they continuously receive top honors on the state, national and international stages. Students have the option to broaden their skillset and increase their performance opportunities by participating in an enrichment program. Electric Strings. We meet twice weekly after school to practice skills unique to the electric string family. To participate, students must also be enrolled in an orchestra class. Members of this group have the opportunity to perform with SHOCKED, our electric strings performing group. Harp. Students from both band and orchestra may participate in the extensive harp program offered by Mesa Public Schools and MVHS Performing Arts Department. Encouraging students to enjoy playing their instrument for a lifetime.